A delicious, smooth, perfect Margarita is made with FrancosÂ® Lime Bar Mix. 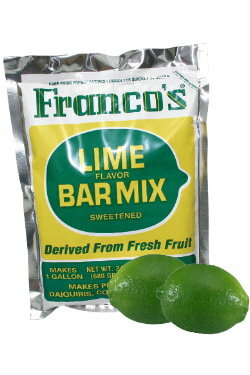 FrancosÂ® Lime Bar Mix is packed in moisture proof poly-foil pouches for convenience in shipping, storage and long life. This product is produced using only the finest U.S. ingredients available. It contains no artificial sweeteners, no additives and no preservatives. Only 100% cane sugar. FrancosÂ® Lime Bar Mix will not settle or separate. Consistent in taste and quality. It is easy to prepare-dissolves quickly in water. 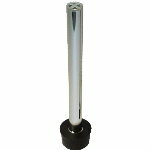 With a long lasting creamy head, it is a product the bartender is proud to serve. FrancosÂ® Lime Bar Mix has been served in the finest bars, restaurants and hotels Around the World for over 38 years. Distributed in over 40 countries. One of the most recognized brands In the World.